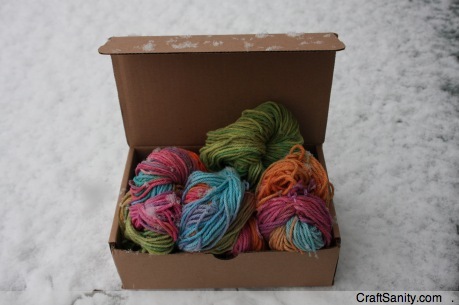 If you found a box “filled with yarn or every color,” what would you do? 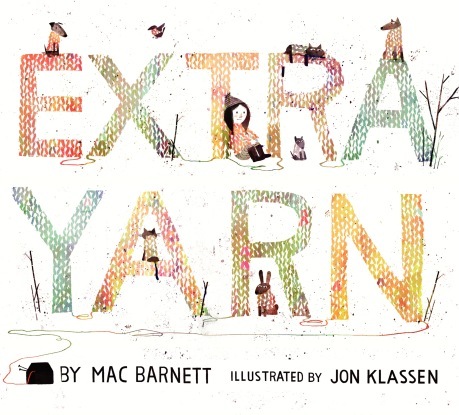 When this happened to Annabelle, the little girl featured in the new picture book “Extra Yarn” written by Mac Barnett and illustrated by Jon Klassen, she decided to knit herself a sweater. There was extra yarn left over, so she knit a her dog a sweater, too. 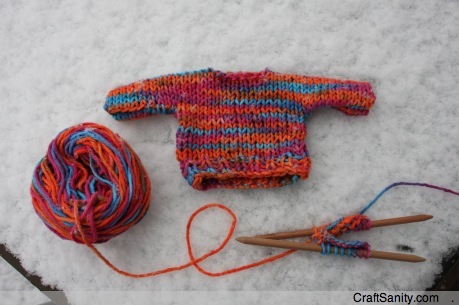 And so begins a delightful tale of an exuberant knitter and the magic of craft. After enjoying this lovely book with my daughters, I decided to interview the men who created it, and they did not disappoint. Tune in to CraftSanity Episode 129 to hear my chat with Mac Barnett, 29, and Jon Klassen, 30, about how this book came to be. You can also read the column I wrote about the book in Sunday’s Press and online Monday over on MLive. Both men live in California and are rising stars in children’s literature. Barnett, of Oakland, has been cranking out picture books including “Billy Twitters and His Blue Whale Problem,” “Guess Again!”, “The Clock Without A Face,” and “Oh No! (Or Home my Science Project Destroyed the World.” He is also the author of the Brixton Brothers mystery series that my 7-year-old daughter just started reading. Meanwhile, Klassen, who is originally from Canada, lives in Los Angeles where he illustrates children’s books full-time. He is the author and illustrator of “I Want My Hat Back,” a New York Times Best Illustrated book of 2011. He is the illustrator of “Cats’ Night Out” by Caroline Stutson and the middle-grade series “The Incorrigible Children of Ashton Place” by Maryrose Wood. Before he started illustrating books, Klassen worked in animation and worked on the stop-motion film, “Coraline” based on the book by Neil Gaiman. 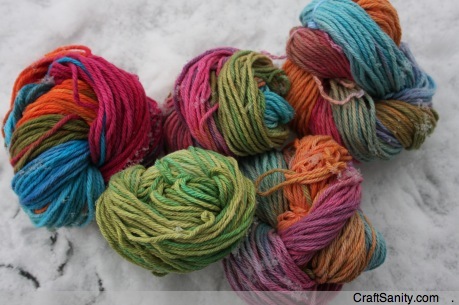 DYE YOUR OWN YARN! You can check out my recent “Extra Yarn” inspired craft segment on the the local ABC affiliate here in Grand Rapids, WZZM Channel 13, during which “Take Five” Host Catherine Behrendt and I show viewers how to cotton yarn with Rit dye. 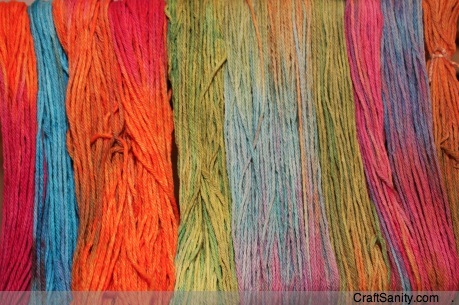 I will post more information on my dyeing experiments in a follow-up post. And, in case you’re wondering, the mini-sweater pictured near the top of this post was adapted from the sweater ornament pattern that was published in the first issue of CraftSanity Magazine. THANKS TO OUR EPISODE SPONSOR! This episode of the podcast was sponsored by House of Moss, where you’ll find home décor and little soft sculptures made of felted wool and other natural materials. Alison Comfort uses acorn caps, wool and upcycled jar lids and bottle caps to recreate the mysterious and beautiful world of the forest floor for you to adorn your home. Check out Alison’s creations at HouseOfMoss.etsy.com. Thanks, Alison! BECOME A PODCAST SPONSOR: If you’d like to sponsor the next episode, you can find sponsorship info here. Have you ever thought about publishing an ebook or guest authoring on other sites? I have a blog based on the same information you discuss and would love to have you share some stories/information. I know my viewers would value your work. If you’re even remotely interested, feel free to send me an e mail. Very efficiently written article. It will be valuable to everyone who usess it, including yours truly :). Keep up the good work – for sure i will check out more posts. Hello there, You have performed an incredible job. I will certainly digg it and in my view recommend to my friends. I’m confident they will be benefited from this website.